Acne is the most common skin condition in the U.S. There are various types of acne and thus various types of treatments available, including topical and oral medications and light therapy. We are committed to determining which treatment will be the most effective for your skin. Mild acne describes a few scattered comedones (whiteheads or blackheads) with minimal inflammation. 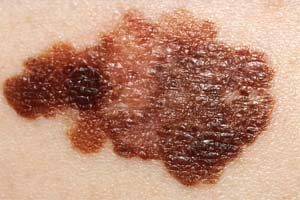 Melanoma is type of skin cancer. It occurs when the melanocyte cells in the skin become cancerous. Anyone can get melanoma. When found early and treated, the cure rate is nearly 100%. Allowed to grow, melanoma can spread to other parts of the body. Melanoma can spread quickly. When melanoma spreads, it can be deadly. Asymmetry: One half is not like the other half. Border: An irregular, scalloped, or poorly defined border. Color: Is varied from one area to another; has shades of tan, brown, or black; is sometimes white, red, or blue. Diameter: Melanomas are usually greater than 6mm (the size of a pencil eraser) when diagnosed, but they can be smaller. Evolving: A mole or skin lesion that looks different from the others, or is changing in size, shape, or color. AKs are dry, rough, scaly patches that form on sun-exposed areas of the skin. 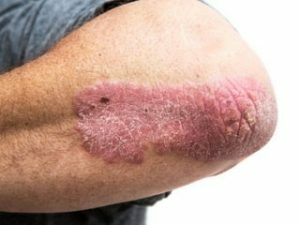 These lesions are pre-cancerous and can be treated several different ways including cryotherapy (freezing), topical medications, and phototherapy. 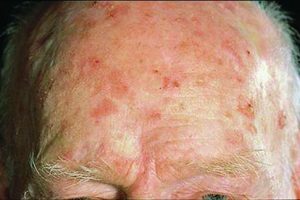 Left untreated, these lesions may turn into a type of skin cancer called squamous cell carcinoma. AKs are quite common and our physicians and PAs are highly skilled in recognizing them. While they still require treatment, AKs are not yet cancer and are easily treated. Patients with a history of AKs should be screened regularly by their dermatologist, e.g. every 6-12 months. When in doubt, don’t assume that a lesion is “just a keratosis.” Schedule an appointment to let us evaluate it to be sure. Psoriasis is a chronic disease. It develops when a person’s immune system sends faulty signals that tell skin cells to grow too quickly. New skin cells form in days rather than weeks. The body does not shed these excess skin cells. The skin cells pile up on the surface of the skin, causing patches of psoriasis to appear. Psoriasis can flare from time to time, causing additional discomfort. Treatments for psoriasis can include topical and oral medications as well as light therapy. Psoriasis is not contagious and is caused by inheriting the genes that cause it. 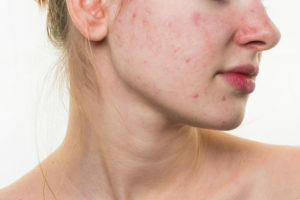 Rosacea is a chronic condition that causes redness and swelling of the face and can also affect the neck, neck, chest, ears, back, scalp, and eyes. Initially, patients notice a tendency to flush or blush easily. The disease progresses into redness, pimples, and tiny visible thread-like blood vessels. 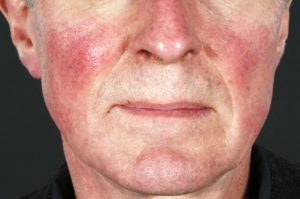 Rosacea occurs most commonly in patients ages 30 to 50 years of age. While women are more commonly affected, men tend to suffer more severe forms. Our treatments include topical and oral medications and can offer patients relief and control.